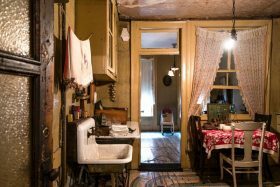 The Tenement Museum will open a new kiosk at the Market Line inside the Essex Crossing development on the Lower East Side, developer Delancy Street Associates announced on Thursday. The kiosk will feature a screen with tour times and other information about the museum. When it opens later this year, the Market Line will run three city blocks and include 100 locally-sourced food, art, fashion and music vendors. The market, projected to be the largest of its kind in New York City, sits inside Essex Crossing, a 1.9-million-square foot mixed-use development. 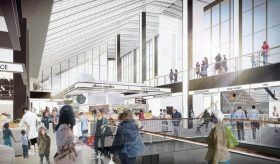 It’s been over a year since we got our first look at Market Line, the 150,000-square-foot market that will anchor the Essex Crossing mega-development. 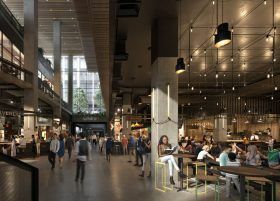 It will serve as the new home for the Lower East Side‘s iconic, 76-year-old Essex Street Market and boast two indoor parks, a beer garden, 150 food vendors, and 20 retail spaces–all adding up to the city’s largest food hall. 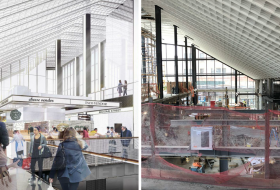 Eater now has spotted a fresh set of renderings of Market Line, as well as the first vendor announcement. Among those who will be hawking their grub are Queens’ famed taco spot Tortilleria Nixtamal, the Upper East Side’s 100-year-old German meat market Schaller & Weber, and the East Village’s Ukrainian institution Veselka.